Mmmm…Pizza. Anyone following a low-carb diet or no carb diet knows that just mentioning this tasty concoction is enough to make mouths water. Savory meats, creamy cheeses, delicious vegetables, tangy sauces, and the crusts-ranging from thin and crispy to deep dish, to the ever-popular traditional variety-no matter which style you prefer, pizza has become a favorite food for many. As popular as pizza is today, many weight-conscious individuals erroneously believe that it is “off limits”, due to the high carbohydrate content. 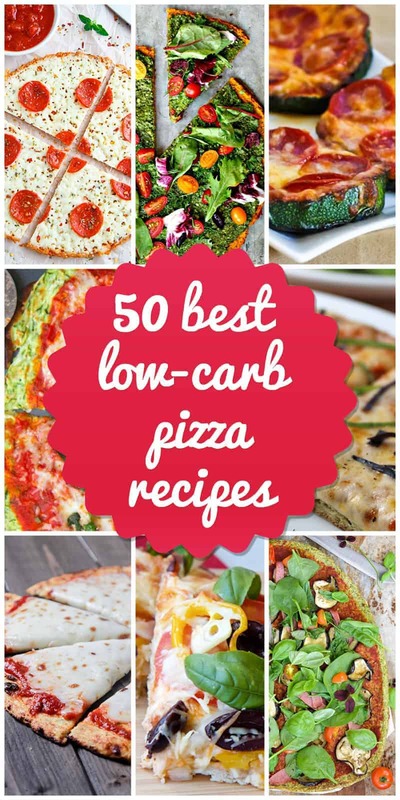 Thankfully, there are plenty of delicious, easy low-carb pizza recipes and no carb pizza recipes available today, that are not only good for your waistline, they are better for your overall health. Numerous scientific studies have shown that people that limit their carbohydrate intake, by substituting low-carb foods for high-carb foods, have higher levels of HDL cholesterol (the good kind) in their blood than dieters that only focus on following a low-fat eating regime. This means that limiting carbs is not just an effective tool to use for weight management. It can improve cardiac health by helping to reduce the risk of developing Coronary Artery Disease. Replacing carbohydrate-rich foods like white potatoes and white flour pastas and noodles, with low-carb foods, gives your body more of the nutrients it needs. 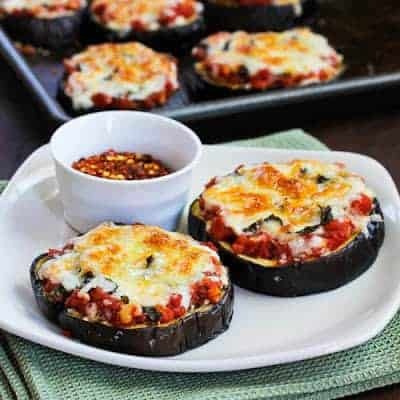 Thanks to the creation of these delicious, low-carb pizza recipes, such as Roasted Garlic Spinach White Pizza, Julia Child’s Eggplant Pizza or any of the others presented here, it is now possible to enjoy low-carb eating, without sacrificing great taste in an effort to eat healthier. 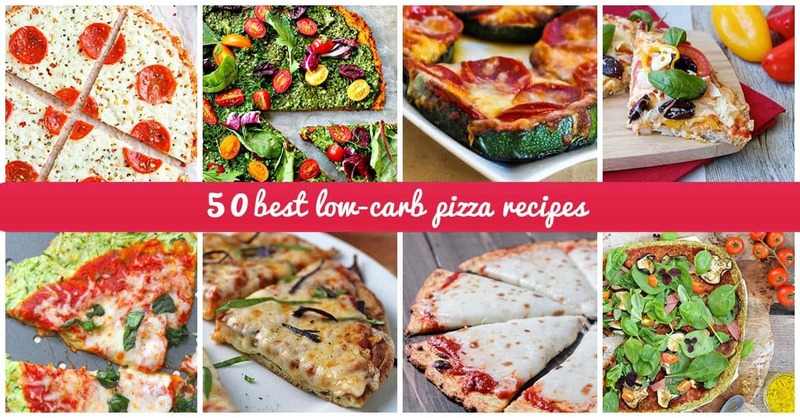 Looking for Great Low Carb Pizza Recipes? We’ve Got You Covered! 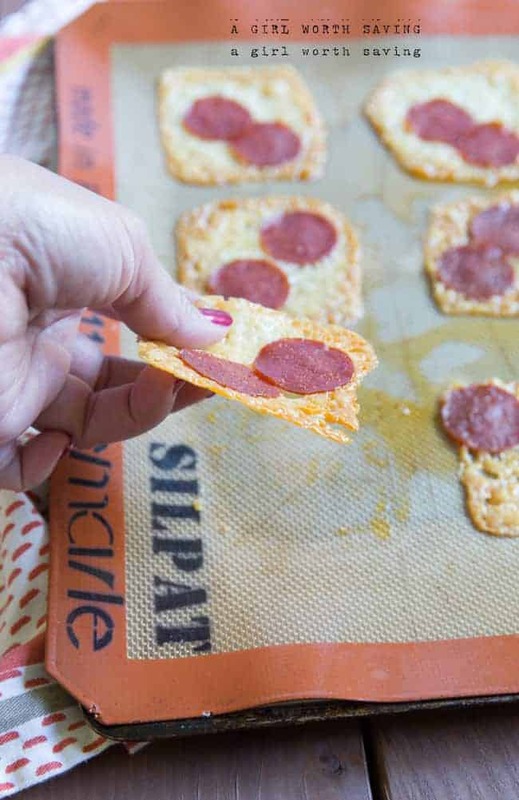 This tasty, low-carb pizza crust allows you to indulge in your favorite craving, without blowing your diet. Coconut and Almond flours replace the white flour used in most pizza crust recipes. Oregano, Parmesan Cheese, and Olive oil create the distinctive Italian flavor that makes this recipe a winner, no matter which toppings you choose. Perfect for anyone that wants to eat well while aiming for a low carb count. Sometimes you just want a mid-afternoon snack that satisfies, but doesn’t take forever to prepare and still allows you to adhere to a low-carb diet. These mini deep dish pizzas fit the bill perfectly. This recipe uses 5 simple ingredients and only takes 25 minutes from prep to table. 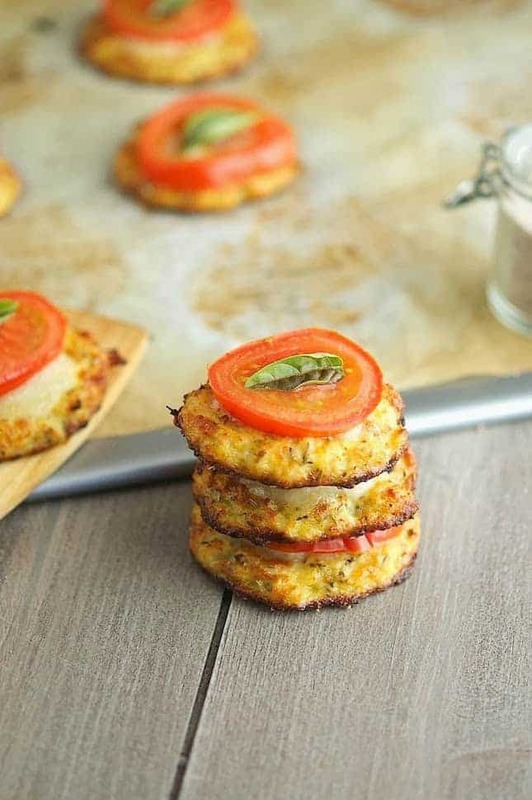 These little pizzas will change the way you think about low-carb. They make a great after-school snack for your little ones too, without ruining their appetite for dinner. Trying to decide how to work in more green vegetables on your diet? This pizza is a great way to it. Roasting the garlic transforms it into a creamy, almost buttery consistency. The flavor becomes milder and sweeter. This easy low-carb pizza recipe, paired with a healthy salad, makes a deliciously filling weeknight dinner. 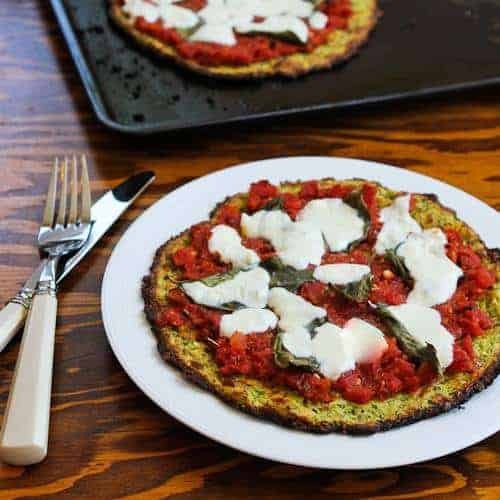 Instead of reaching for the phone to order an expensive pizza for delivery, treat yourself to this mouth-watering low-carb pizza. Making a satisfying low-carb pizza that everyone will enjoy simply does not get any easier than this recipe. 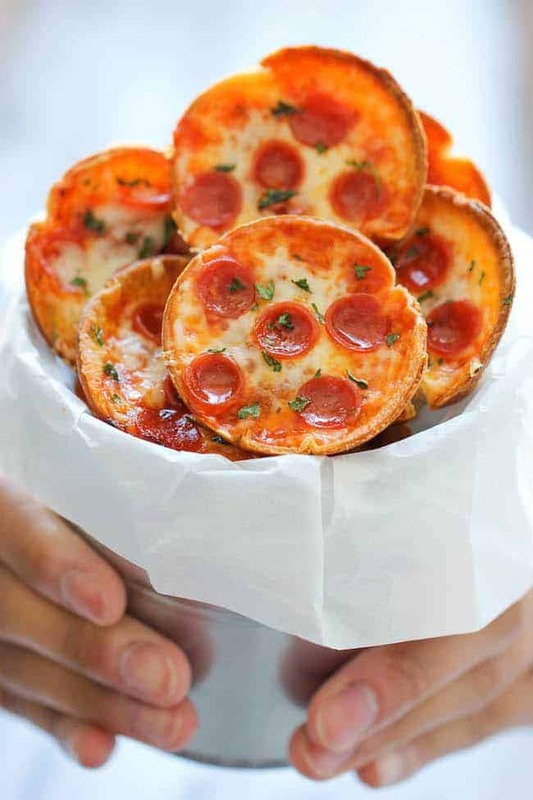 This unique take on pepperoni pizza is sure to be a hit with everyone in your family. No more badgering the kids to eat the crust end pieces. With this recipe, there is absolutely no crust. Nothing gets wasted which saves money too. Crispy, cheesy, and tangy. Who knew a low carbohydrate pizza could taste this good? Eating low-carb diet doesn’t mean you have to give up things you love, like snacks. Easy low-carb recipes like this one are a great way to keep hunger at bay between meals, or to enjoy anytime you are craving something crunchy and crispy. Make a batch of these satisfying crackers the next time you have a “snack attack.” This recipe only requires 2 ingredients and 20 minutes to prepare. What could be easier? 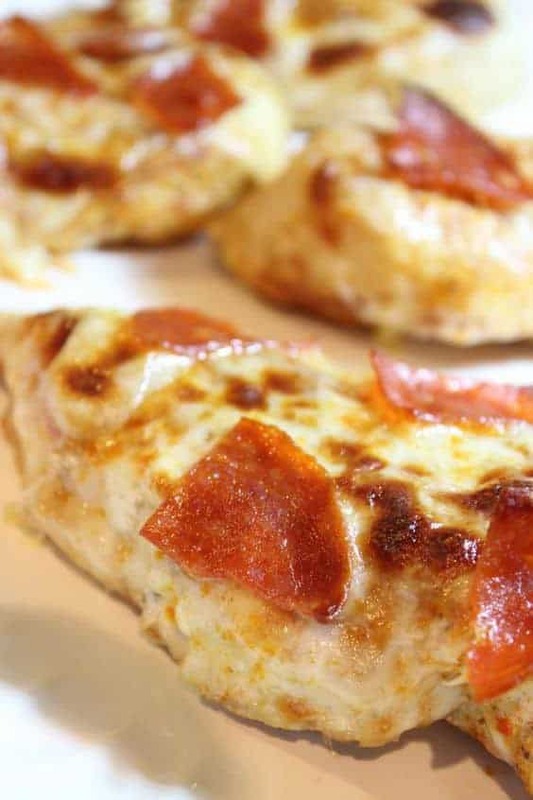 Fat Head Pizza has long been regarded as the ultimate easy low-carb pizza recipe. 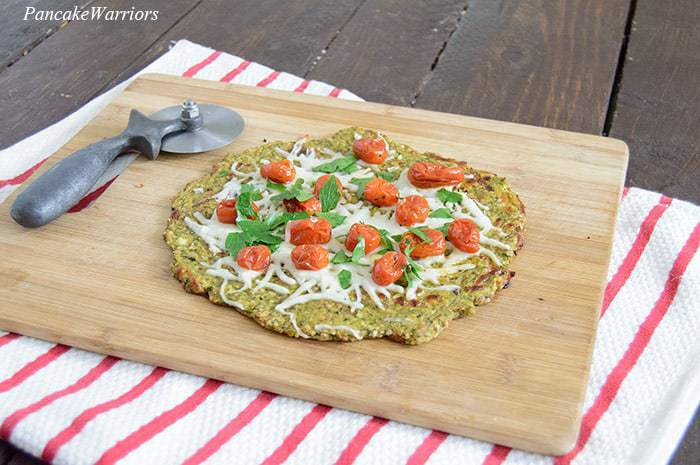 Who would have thought that a grain-free, gluten-free, low-carb pizza could taste this good? Almond flour replaces the white flour usually used in the pizza dough recipe, contributing to the lower carb count. Adding your favorite dried herbs to the dough before baking affords you the opportunity to experiment with different flavors. This is certain to become one of your favorite low-carb recipes of all time. 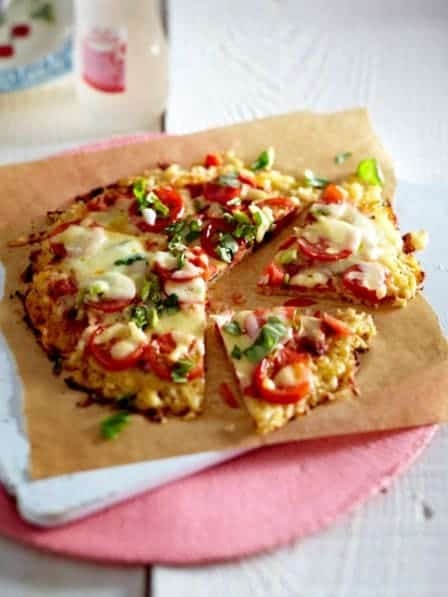 The masterful combination of Cauliflower and Gouda Cheese for this low-carb pizza crust is just one of the reasons that make this low carbohydrate pizza stand out. The fresh basil, chunky tomato sauce made with fresh tomatoes, healthy olive oil, and oregano lend their distinctive Italian flavors to this easy low-carb pizza recipe. Fresh ingredients, like the ones featured in this recipe, make for a rich, palette-tempting meal. Ground chicken is high in protein and makes a surprisingly perfect low-carb pizza crust. Once the mixture is pressed out into the cookie sheet, this crust recipe will bake up nice and crispy. This recipe makes enough “dough” for 2 pizza crusts. 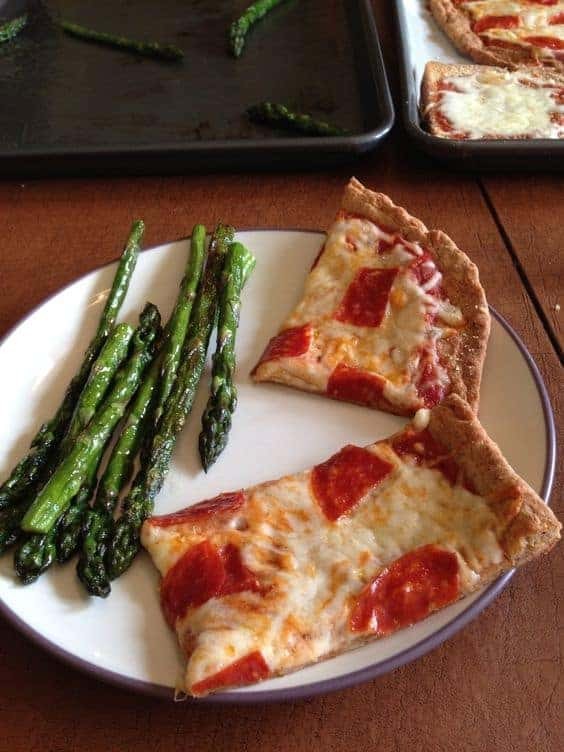 After baking the crust, top it off with some of your favorite low-carb foods, like fresh vegetables, for a yummy pizza crust twist. 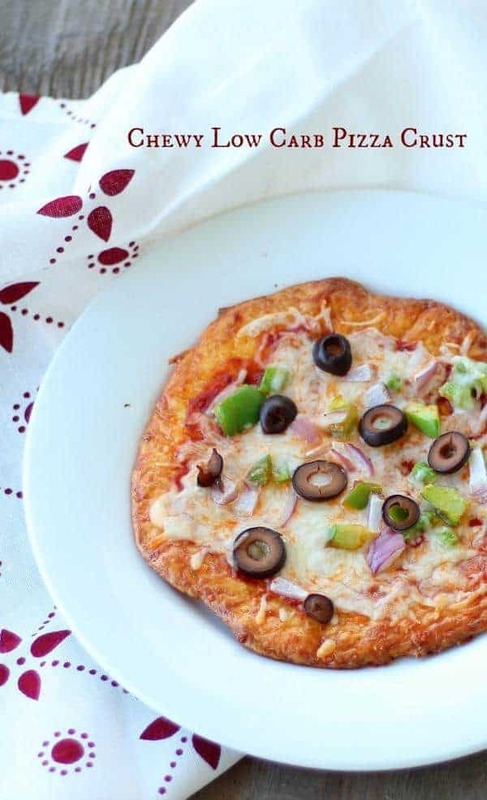 This low carbohydrate pizza recipe’s surprising ingredient, Psyllium Husk Powder, produces a bread-like texture that is reminiscent of its higher carbohydrate cousin. 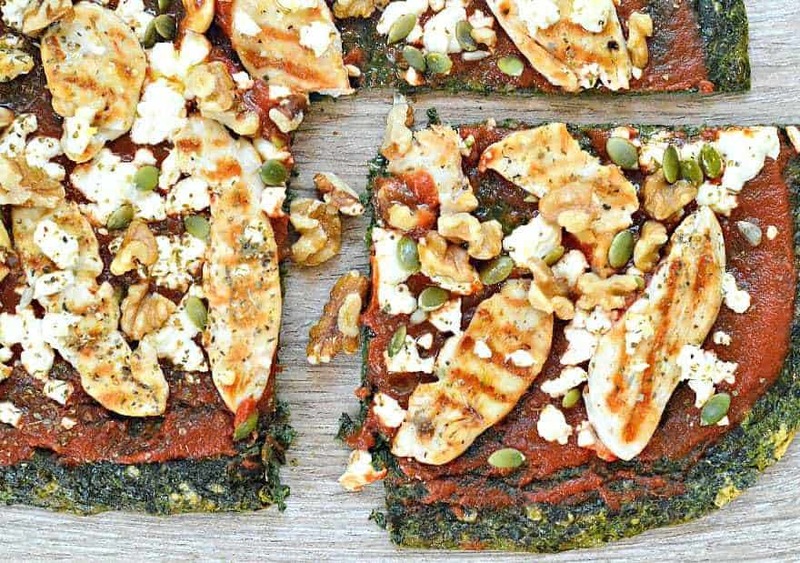 This delicious pizza is high in protein and fiber, while delivering only 3.5 g of net carbs for the entire pizza! Add quality tomato sauce, smooth-melting mozzarella, and thinly sliced fresh basil for a fulfilling meal. This pizza may taste like you cheated on your diet, but it is a guilt free indulgence. It’s a sad fact that there are a few low-carb recipes out there that lack the imagination and taste required to make them crave-worthy. Thankfully, this recipe for Incredible Squash Pizza isn’t one of them! This grain-free, gluten-free winter squash crust is suitable for eating by hand or with a knife and fork. The green pizza sauce is a great way to incorporate more heart-healthy vegetables into your daily diet. If you’re searching for easy low-carb recipes that the entire family can help make, and that they will enjoy eating, look no further. This low carbohydrate pizza tastes fantastic. It is also a no-fuss way to start teaching your children valuable cooking skills. 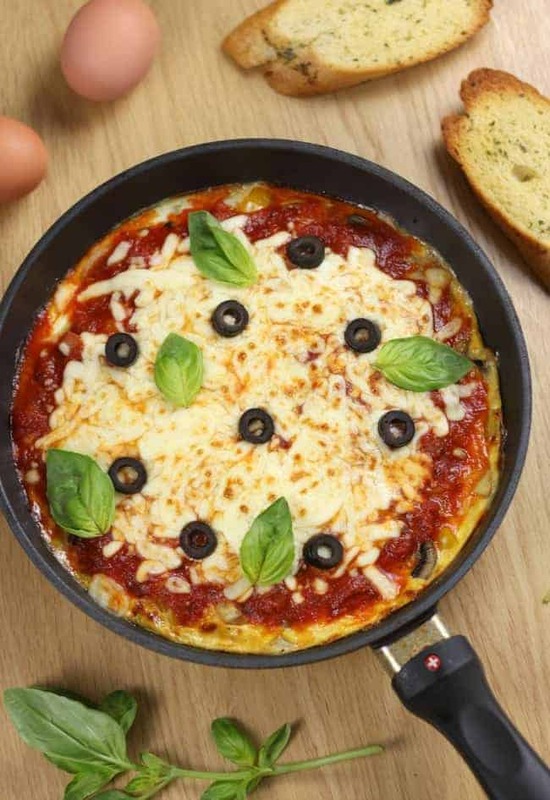 Your mini chefs will enjoy making their own meals, especially when it is as delicious and satisfying as this recipe for Pan Pizza. It’s never too early to start teaching the next generation healthier eating habits. This recipe for is destined to become one of your favorite easy low-carb recipes. It is a great way to use up any leftover spaghetti squash by turning into a delicious, guilt-free pizza. To avoid ending up with a soggy pizza crust it is important to remember to use several paper towels to squeeze out any excess moisture from the spaghetti squash before you mix it with the eggs and spices. Every so often, while searching for low-carb recipes to try, I stumble across one that pleasantly surprises me. This is one of those recipes. From the beautiful deep ruby color of the crust to the amazingly good taste, this is a low-carb recipe you simply have to try! 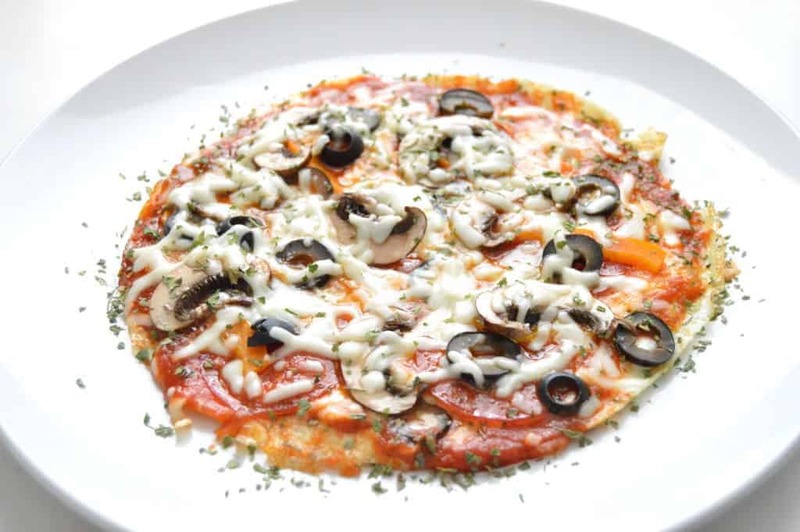 Even if you are following a no carb diet, it is worth rewarding yourself by making this delectable pizza as a treat. As an added bonus, this pizza is also gluten and sugar free. Thanks to home cooks experimenting to find ways to make some of our favorite dishes a bit healthier, many of our favorite foods now have lower carb versions we can enjoy. 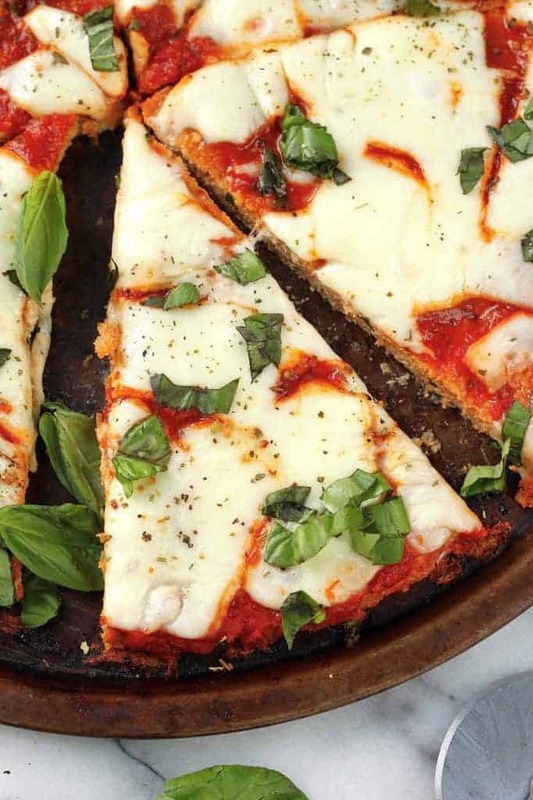 This Cauliflower Pizza Crust recipe contains zero flour. 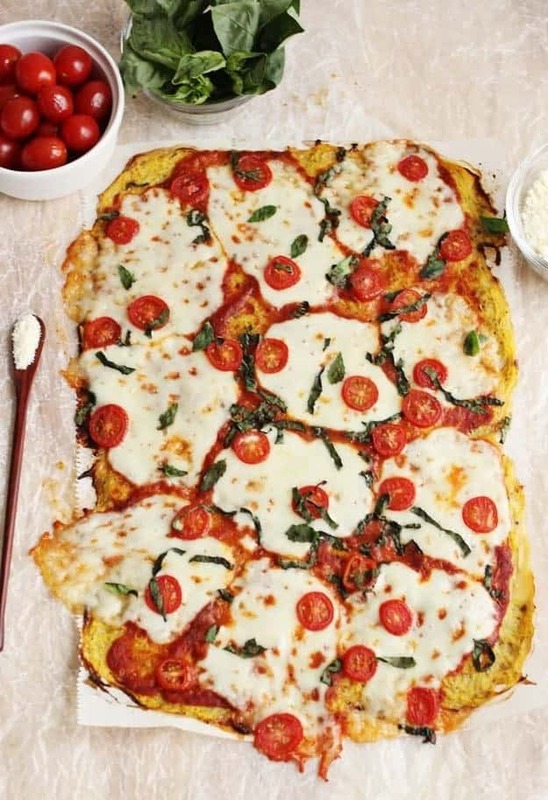 Versatile cauliflower replaces the flour and makes this pizza crust both low carb and delicious. *Helpful cooking tip: Make sure to squeeze ALL of the moisture out of the processed cauliflower for a crisp crust for your toppings. 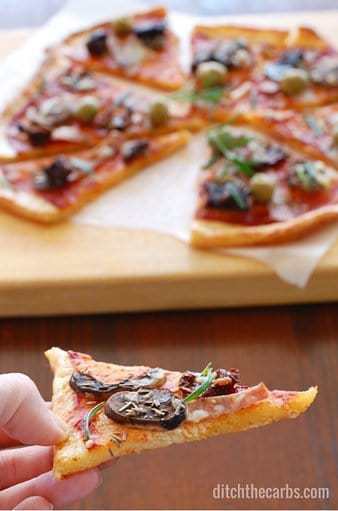 If you are an adventurous cook that enjoys trying new things or experimenting with unusual flavor combinations, you are sure to enjoy this recipe for rustic miniature pizzas. 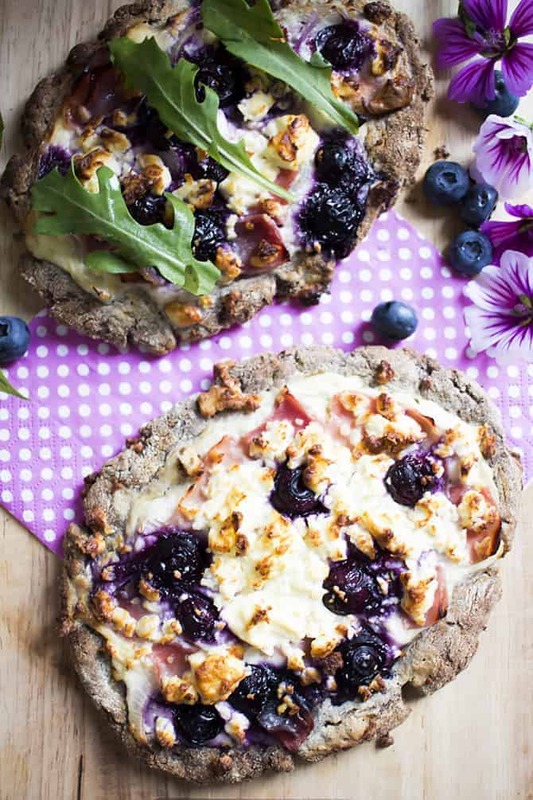 This refreshingly different pizza combines ham, feta cheese, onion, and garlic with other non-traditional pizza ingredients such as sour cream, dried coconut and blueberries. It provides a delightful mix of savory with just a hint of natural sweetness. 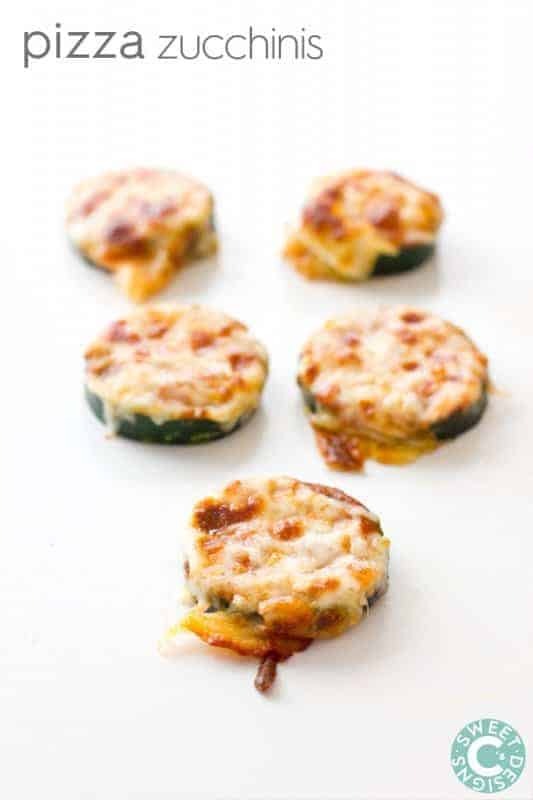 Whether you are looking for an easy appetizer recipe or just want to whip up a guilt-free, low carb snack for yourself, these Pizza Zucchinis are a breeze to make and oh, so delicious! Instead of using baked dough for the base for your sauce and cheese, this recipe calls for sliced zucchinis. It is an excellent way to eat more vegetables while indulging in your craving for that familiar pizza taste. So easy to prepare and good for you, too! With a nod of recognition to its famous Neapolitan ancestor, this Margarita Meatza pizza takes a time-honored classic and elevates it to a whole new level of yumminess, by using a crust made of ground turkey. If ground beef or even ground sausage is more to your taste, it can be easily substituted with the same fantastic results. Meat lovers everywhere will rejoice over this pizza! This recipe is perfect for anyone that is gluten intolerant as well. 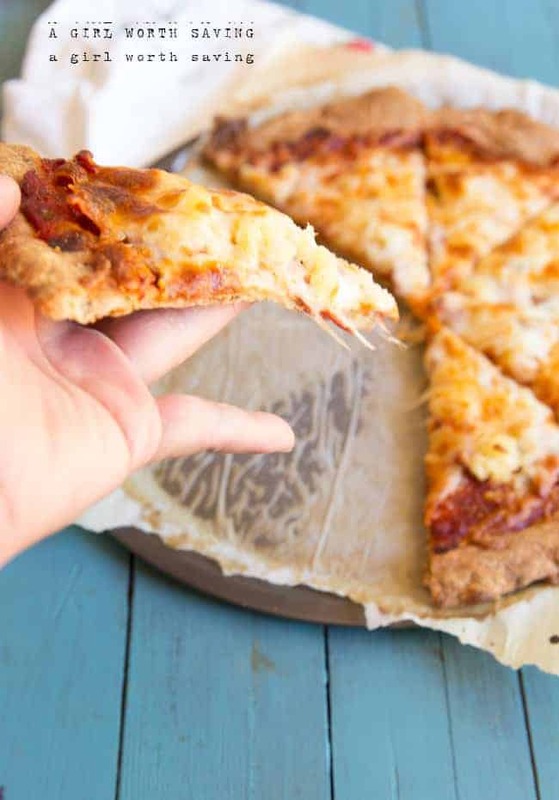 If you want to treat yourself to a delicious low-carb pizza, this pizza crust recipe is one you’ll want to try. This crust uses hemp seeds, which have 3 grams of carbs while, at the same time, providing 3 grams of fiber per serving. It achieves a good balance of that crispy and chewy texture that so many of us crave. Use either parchment paper or a silicone non-stick mat underneath the dough while baking to make it easier to handle. 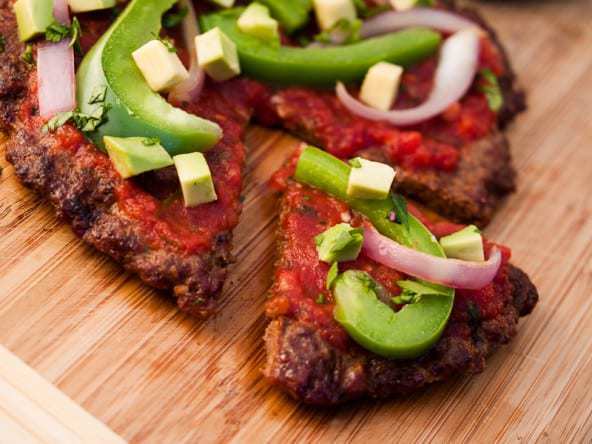 Once you try this recipe for Mexican Meatza Ole Pizza, don’t be surprised if it replaces the decidedly less healthy “Tuesday Taco Night” in your weekly meal planner. This recipe does not have any cheese in it, but have no fear. The avocados, red onions, salsa, green bell peppers, and fresh cilantro and lime juice provide so much mouth-watering flavor for your taste buds, you’ll never miss the cheese. Ground beef makes up the crust for this South of the Border sensational pizza. Pepperoni pizza has long reigned as the most popular variety of pizza. 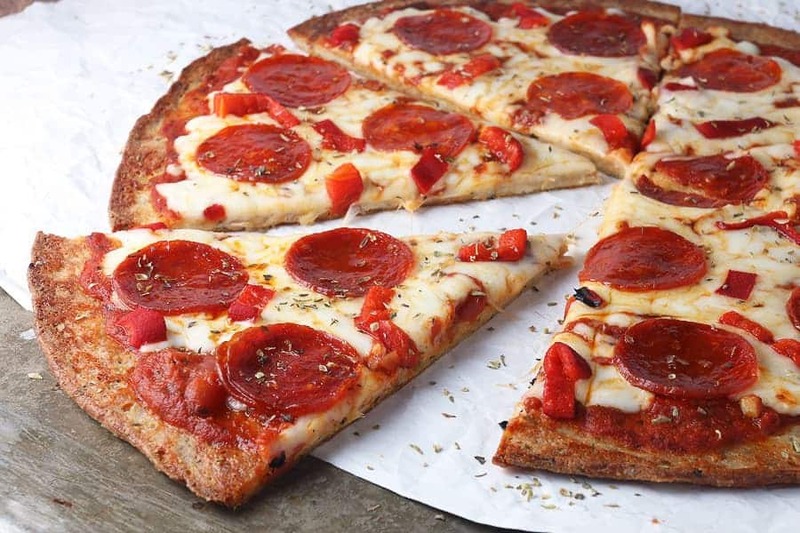 This version retains the look and taste of traditional pepperoni pizza, but has a much lower carb count. The crust holds up well to the sauce and the toppings, and makes for great-tasting leftovers the next day. It is easy to prepare, especially on those busy week nights when time is at a premium. The next time you want a great pizza fast, reach for this one. This pizza recipe is a must for busy moms. It is easy and quick to prepare, delicious, and it is low-carb as well. This would be a great dinner project for your kids. They can help assemble the pizzas while a grown-up handles the “cooking” portion of the recipe. Get creative with your toppings. You can even show your kids how to make happy faces with the pepperonis. This is a great way to get them involved in the kitchen! Is it a pizza or is it a casserole? It’s both! 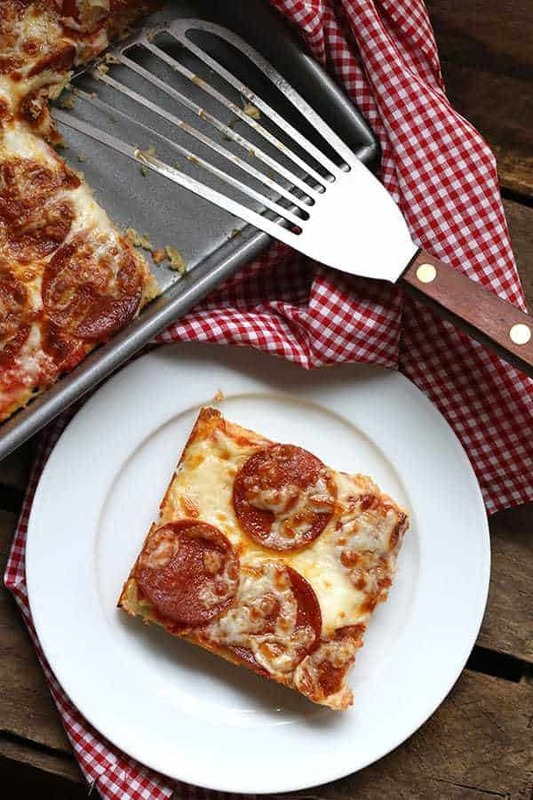 This recipe does away with the crust and features all of the best parts of a pizza in an easy to serve casserole. 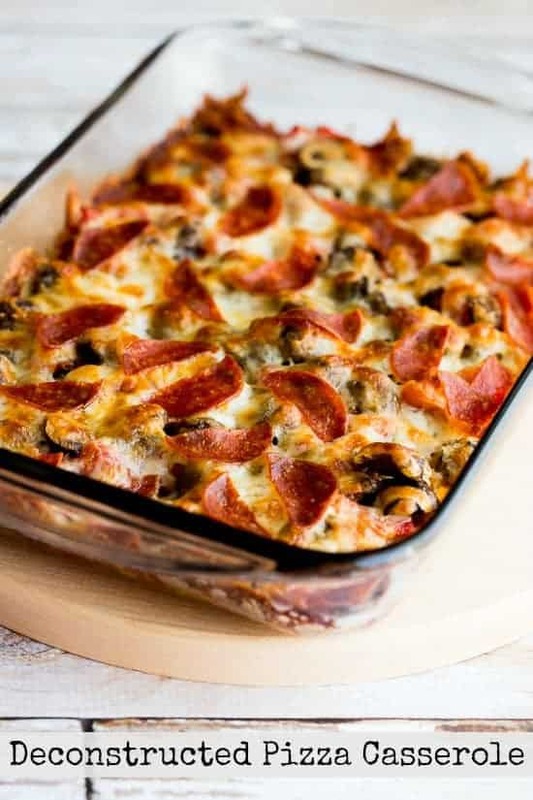 Italian turkey sausage, tomatoes, mushrooms, pepperoni and mozzarella cheese come together in one low-carb, soul-pleasing dish. This is the perfect meal to serve on those cold winter nights. Everyone loves comfort food and with this recipe, you can enjoy it without feeling guilty. 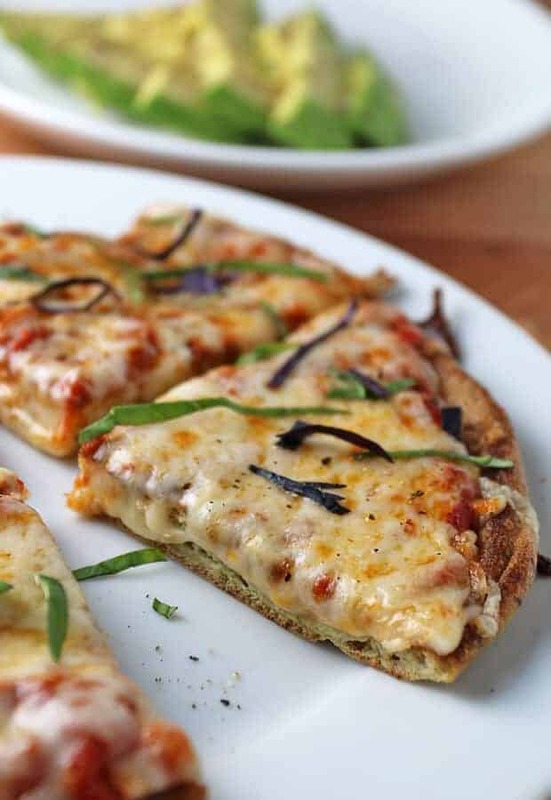 This recipe is for low-carb pizza crust has a nice bread-like texture. The ingredients are easy to find in any grocery store. It makes a great pizza crust substitution. It can be used to replace bread in other scenarios. Instead of doing without hamburger or hot dog buns when the urge to cook out strikes, try using this recipe as a bun replacement. It is a great tasting alternative to high-carb bread. While this isn’t exactly a no carb pizza, the net carbs are low enough that it isn’t too far off. 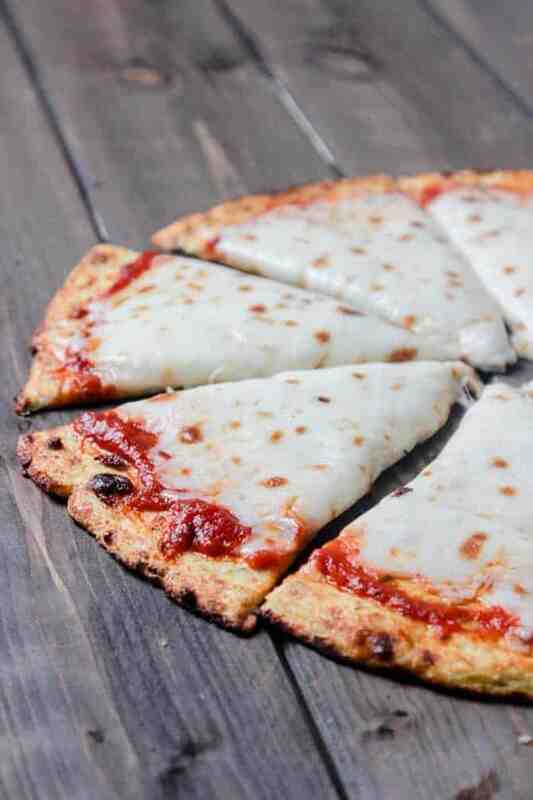 This Cauliflower Pizza Crust recipe can be made as an occasional indulgence for those following a no carb diet. For those seeking to lower their total daily carb intake, this crust makes a great start to a mouth-watering meal that is easy to make, whether it is dinner on a busy weeknight, an after school snack, or for a relaxed afternoon lunch. This pizza looks fantastic and tastes out-of-this-world! 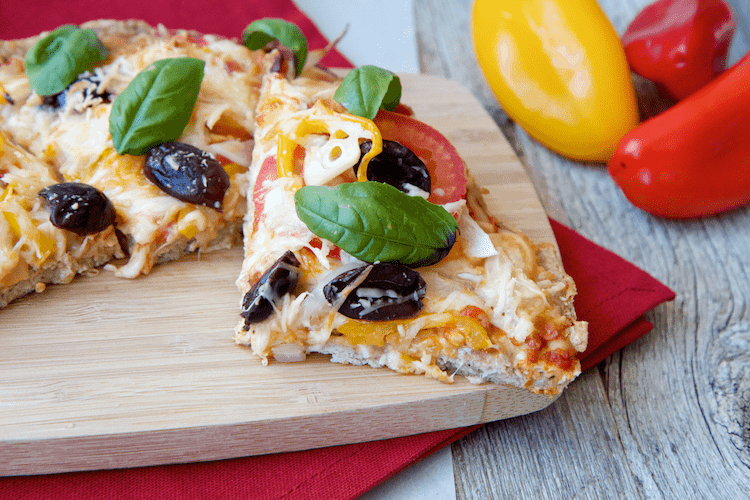 This low-carb, dairy-free, grain-free pizza is such to be a hit at your next get together. They will never guess that the crust is made from broccoli! Top this beauty off with artichokes, baby spinach, onions, cherry tomatoes, bell peppers, or any of your favorites. Try adding goat cheese to the toppings for an extra creamy delight. This is a great way to enjoy eating more vegetables, too. 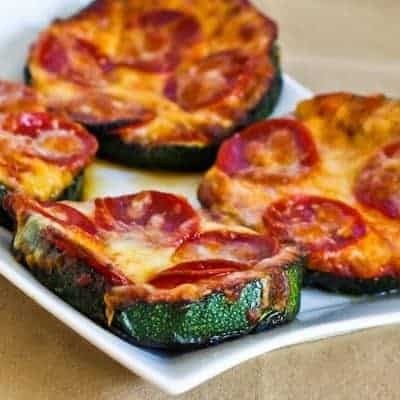 While nothing beats the taste and satisfaction that comes from that first bite of real Garden Veggie Delight pizza from your local pizza parlor, this delicious low-carb recipe comes awfully close. The cauliflower crust is the perfect complement to the cornucopia of fresh, healthy vegetables, roasted to perfection to bring out their slightly sweet caramel goodness. The smooth goat cheese adds a nice textural contrast to the crisp cauliflower crust that is sure to please. These Grilled Zucchini Pizzas are ideal for summer-time cookouts. Large slices of zucchini hold the toppings of your choice nicely and make for ease of handling. This recipe calls for the use of a tomato-based red sauce, but you can use pesto or another sauce more to your liking if you wish. This recipe has a low glycemic index, is low-carb friendly, and is gluten-free. Be sure to try these treats at your next cookout. 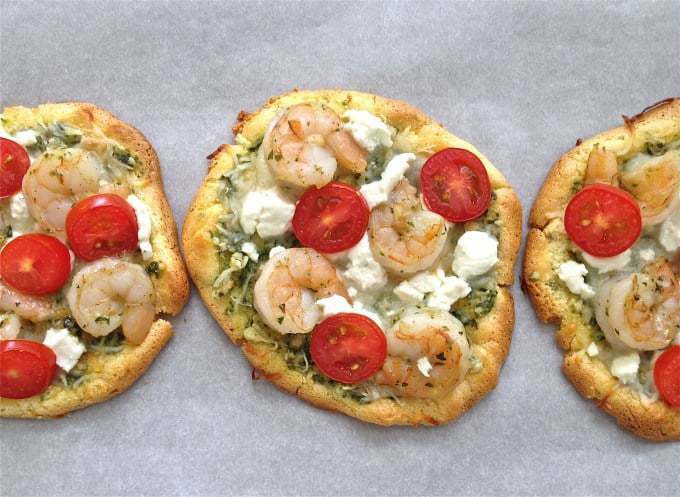 These delightful Pizzettes make great appetizers. Serve them at your next dinner party, sports celebration, movie night, book club gathering, open house…the list of possibilities is endless. The secret to making these crusts crispy to make certain you squeeze out every last bit of water from the cauliflower! Top with any of your favorite toppings and voila! You’ll have a finger food that is sure to impress. They are a great after school snack food, too. 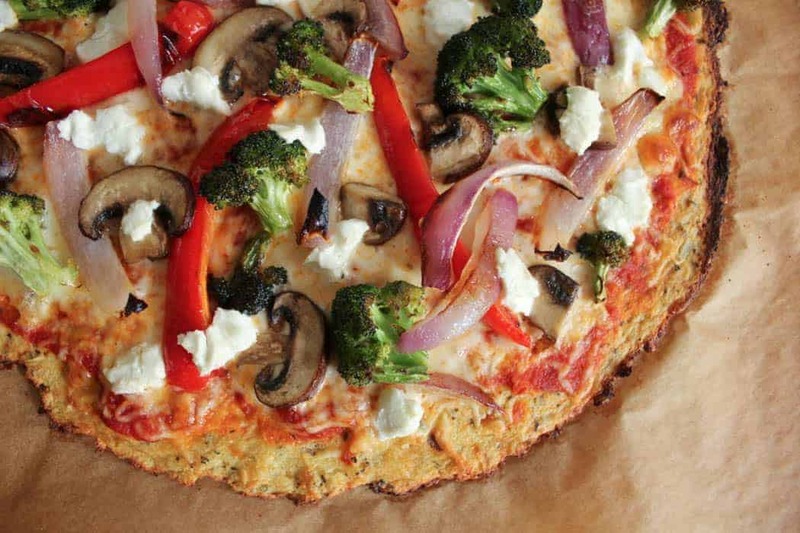 Using cauliflower as a low-carb substitute ingredient in pizza crust is a popular practice. It replaces high-carb flours and produces a delicious crust. 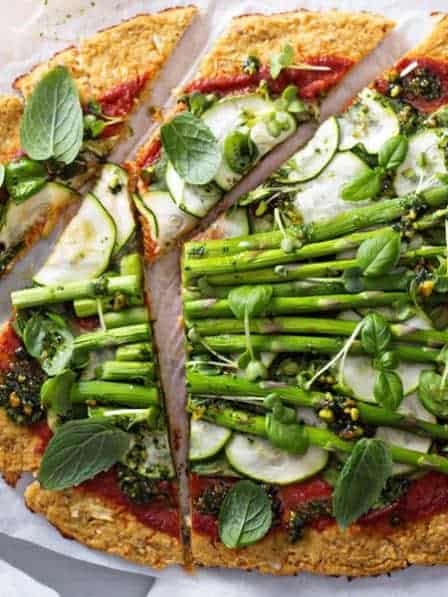 This recipe calls for creative, yet tasty toppings not usually found on pizzas such as asparagus spears, zucchini and basil pesto. 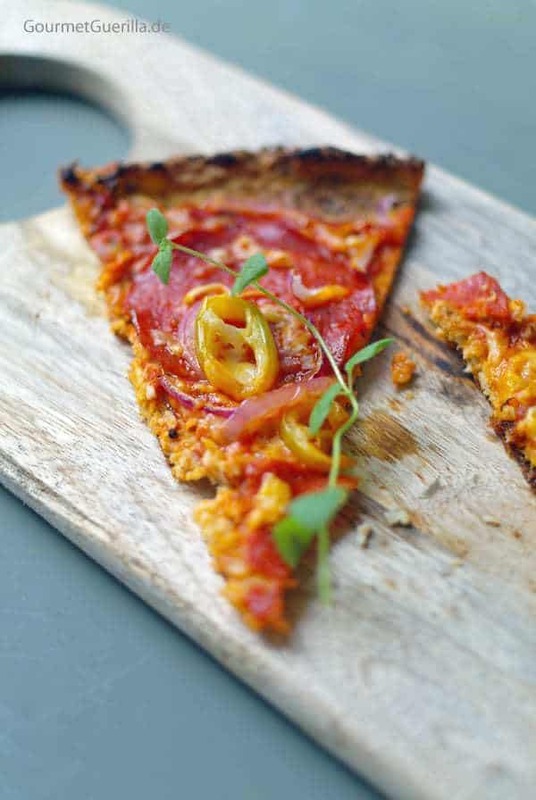 Combine them with the crispy Cauliflower crust, rustic tomato sauce and sprinkle with fresh herbs and this pizza recipe promises to provide a culinary taste experience. 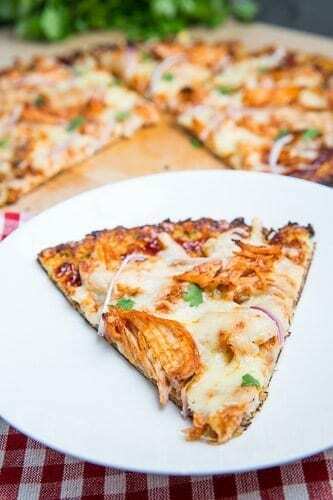 If some of your favorite foods include BBQ Chicken and Pizza, this recipe is sure to be one you enjoy making and eating. Tangy BBQ-sauced chicken, the distinctive flavor of red onion, and melted mozzarella cheese are sure to please even the hardiest of appetites. 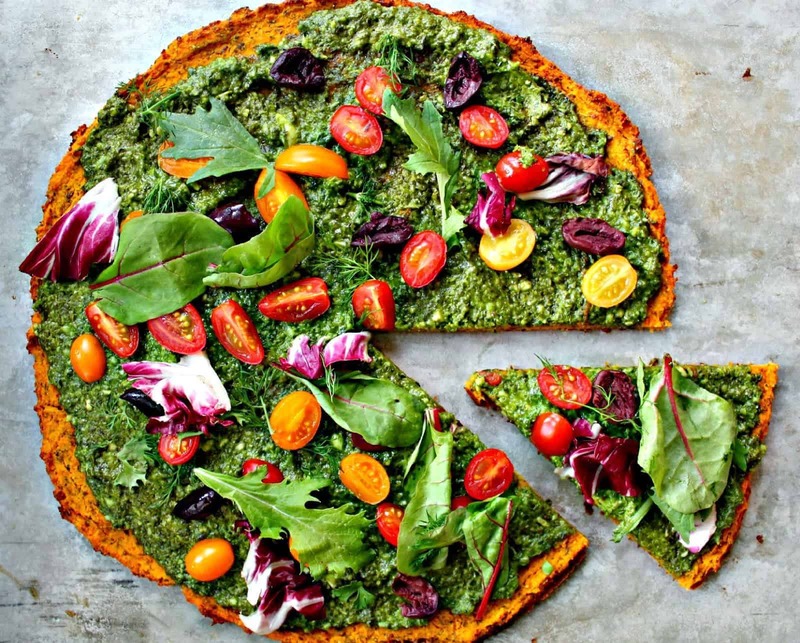 This cauliflower crust is sturdy enough to handle a number of different toppings. Try using different BBQ sauces to create your own signature pizza. 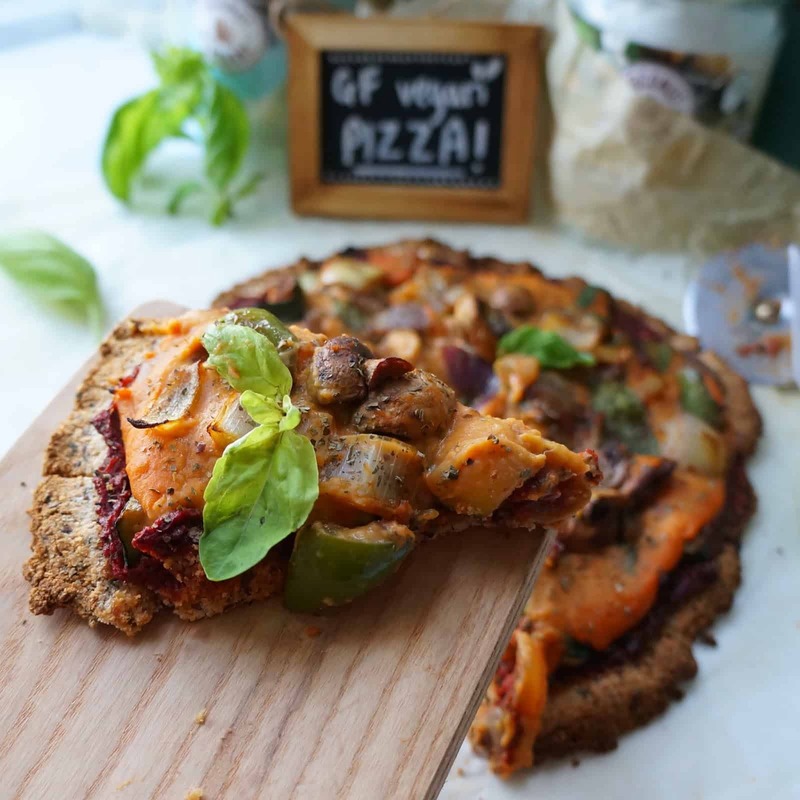 Finding a great tasting, vegan, gluten- free pizza recipe that is low-carb and healthy, is like finding buried treasure: unexpected and wonderful! This recipe replaces gluten-packed grain flour with healthier coconut flour. The “cheese sauce” is a deliciously creamy mixture made from sweet potatoes and coconut milk. 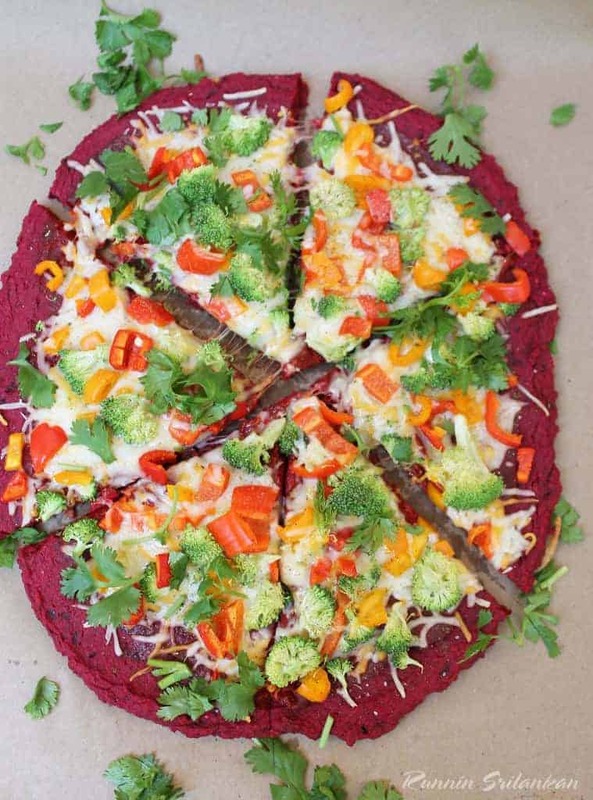 This pizza contains nothing but healthy, good-for-you ingredients that are packed with nutrition and great flavor. 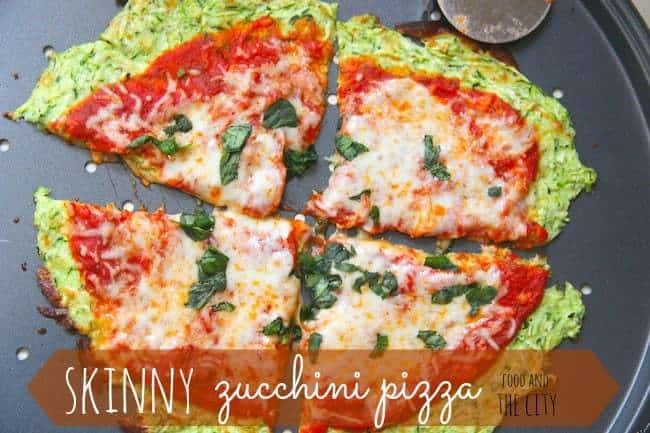 If you are searching for a vegetable besides cauliflower to use as a low-carb crust for your favorite pizza toppings, this zucchini crust recipe might be the answer. Zucchini is a high fiber, low calorie vegetable. These nutritional qualities make is a culinary all-star for anyone watching their weight. The very mild flavor makes zucchini an ideal substitution for high-carb ingredients, such the flour found in traditional pizza crust recipes. This is sure to become one of your go-to low-carb recipes. If you crave a change from the usual low-carb, low-fat pizza on a vegetable-based crust, try this recipe for Pizza Topped Chicken Breasts. It has all of the delicious pizza flavors you want, without the crust, and supplies extra diet-friendly protein in the form of low-fat chicken breasts. Surprise your family with this quick and easy to prepare dish. Pair it with a healthy side salad, and you have a balanced, low-carb meal. This recipe offers a refreshing take on the non-traditional pizza idea. There is no crust. Instead, this “pizza” is actually sauce and toppings of your choice layered on top of a cooked egg white base. A benefit of using egg whites for the base of this pizza is the extra protein they provide. This added protein, combined with the fiber provided from any fresh vegetables you choose as toppings, means that you will feel fuller, longer. 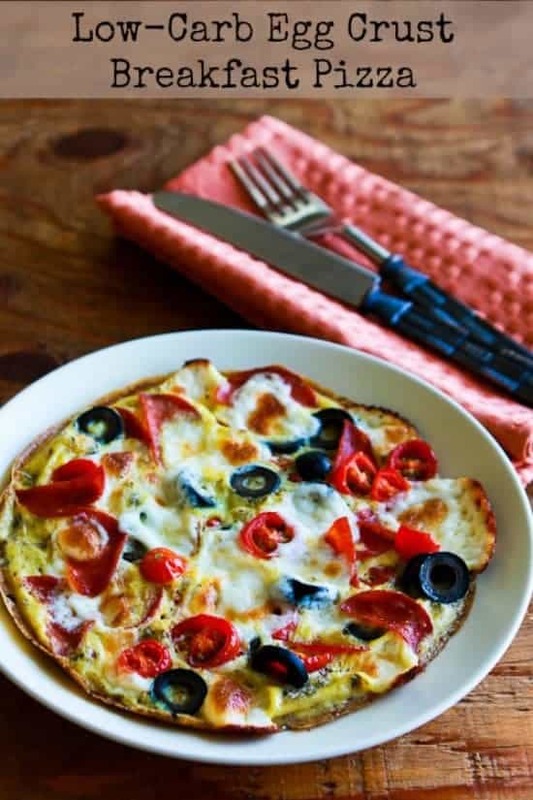 This low carb Pizza Frittata is a perfect to serve for breakfast, lunch, or dinner. It combines everything you love about pizza in an easy to make, easy to serve dish that everyone will love. This recipe serves 6. Whether you are feeding a hungry family or serving a Sunday brunch for two, this delicious frittata fits the bill. If you have a picky eater, this is a great way to get them to eat extra veggies. 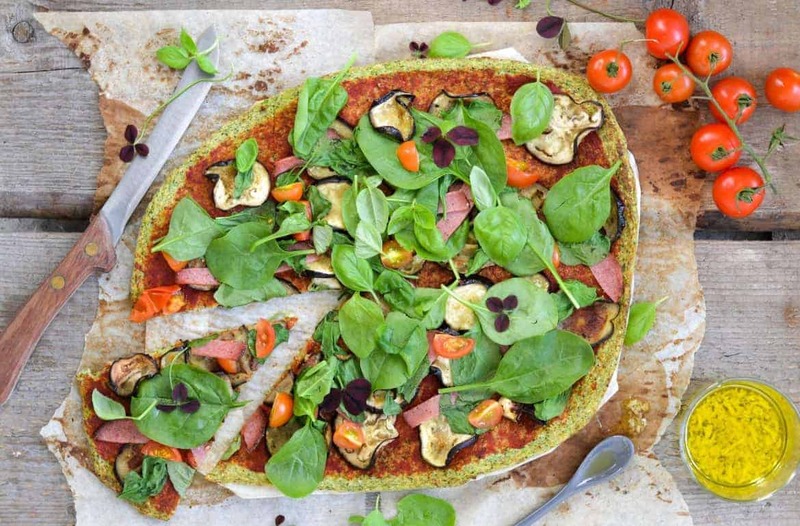 This recipe combines simple, healthy ingredients to make a delicious very low-carb Spinach Crust Pizza. Feta and Edam cheeses, and Grilled Chicken Breasts make a tasty and beautiful presentation on this pizza “crust” made with eggs and tender Spinach leaves. One note of caution: make sure to squeeze out all of the moisture from the spinach before combining with the eggs. If the mixture has too much water in it, the crust will not set up properly. Chef Julia Childs is known the world over for her deliciously rich dishes. She also knew that sometimes, less really is more. 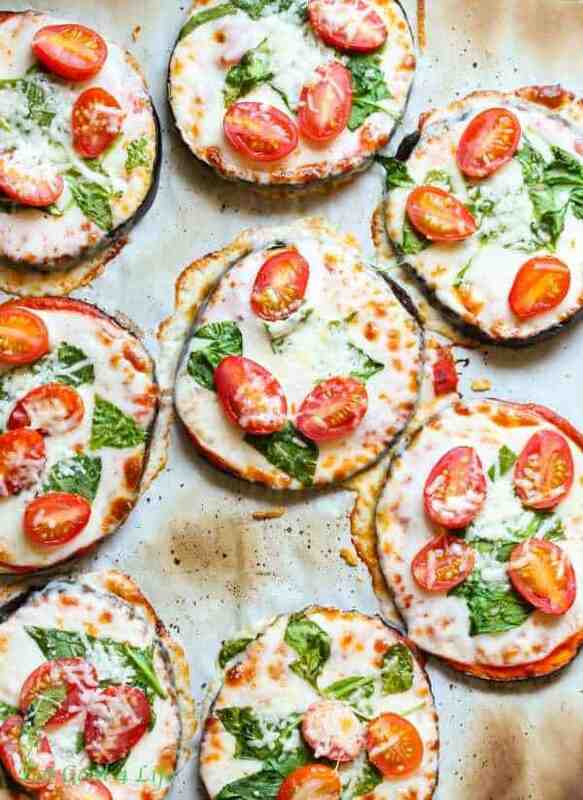 This recipe for Eggplant Pizzas is beautiful in its simplicity and doesn’t skimp on taste. It is low-carb, low-glycemic, gluten-free and vegetarian, making is suitable for just about every diet. It is suitable for serving either as an appetizer or as a main meal. It looks just as beautiful as it tastes. 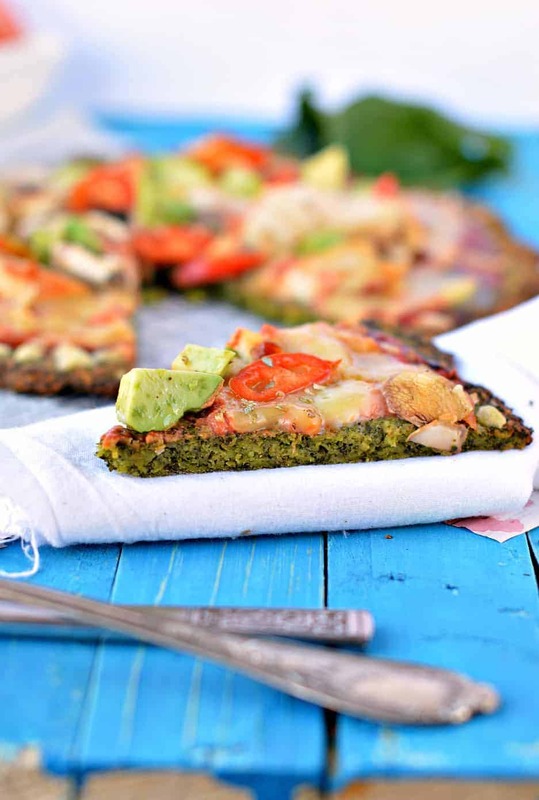 This recipe is a variation of a Cauliflower Crust Pizza. Ground almonds take the place of high carb flour in this recipe. The cream cheese in the dough mixture helps it hold together. It tastes wonderful either as a meatless pizza or topped with your favorite meats, vegetables and cheeses. Chorizo brings a nice level of spiciness without adding too much heat. The Banana Peppers balance out the Chorizo perfectly. Feel free to experiment with different cheeses and meats to find your favorite combination. 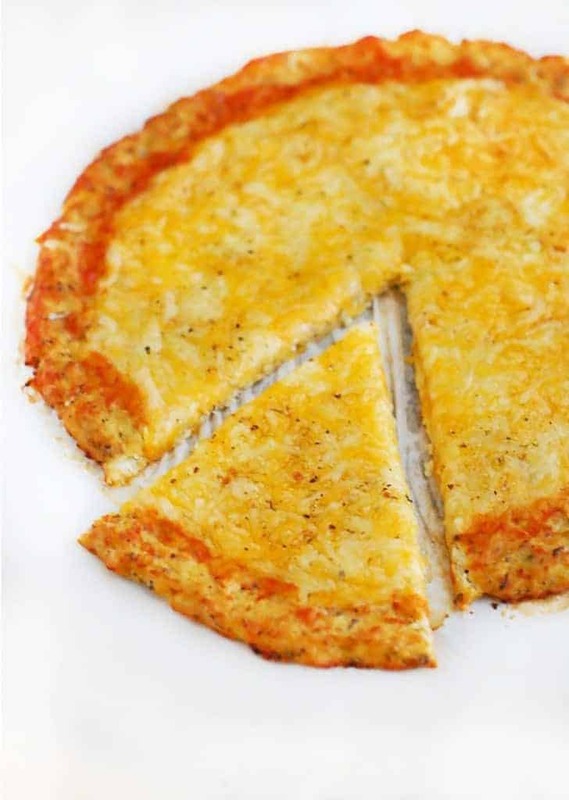 Who would have ever guessed that three simple ingredients (Cauliflower, Gouda Cheese and an egg) could produce a delicious, low-carb, healthy pizza crust that you could top with any number of vegetables, meats, herbs and cheeses? This recipe is easy to make and tastes great. Try making it with arugula, capers and goat cheese for “date night”, to add impressive gourmet flair. With this crust as your base, the possibilities are endless. This pizza is as beautiful as it is healthy. Zucchini adds fiber to this delicious pizza, to keep you feeling full. The longer your hunger is satisfied, the less like you are to crave high carb snacks and foods that can easily derail your best intentions to eat healthier. Focus on eating low carb, high quality ingredients to help prevent those dreaded sugar crashes that often happen with high carb foods. 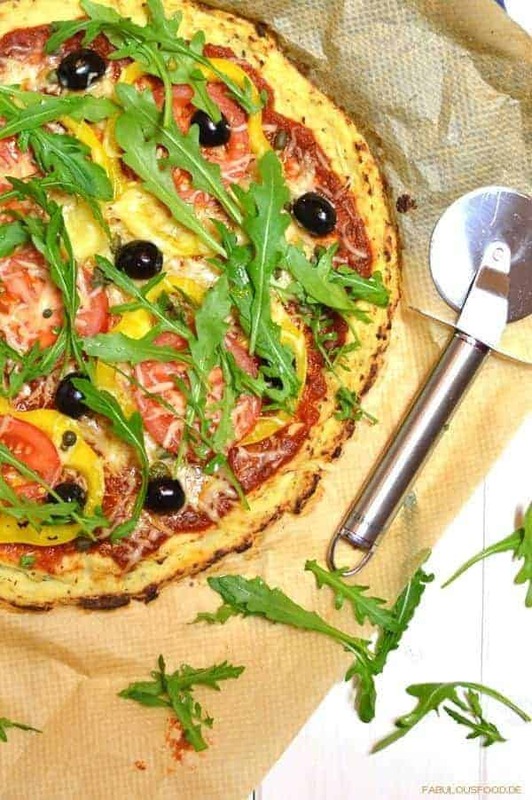 This recipe for Carb Free pizza tastes great and it contains ingredients known to be beneficial to your overall health. Garlic is an antioxidant that helps to neutralize the damaging effects of free radicals on the body. It contains a compound called Allicin, which is thought to be effective at lowering blood pressure. Cauliflower contains important phytonutrients that help fight against dangerous toxins in the body. Oregano contains oil called Thymol, known to have antibiotic-like properties. 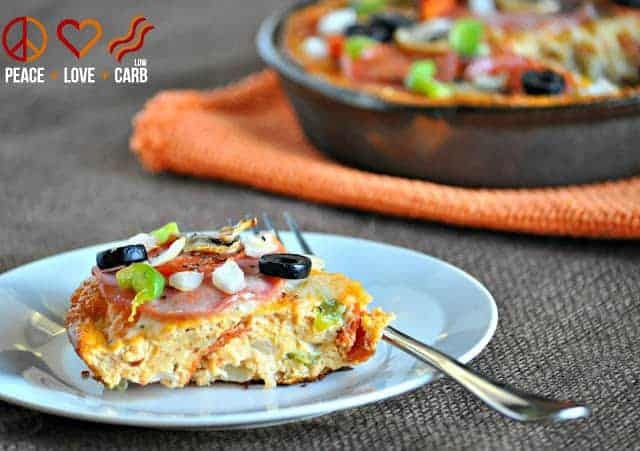 This yummy frittata has all of the classic pizza elements and flavors but replaces the bread crust with an egg based one. Olives contain heart-healthy Omega oil. Basil has anti-inflammatory elements, and garlic contains Ajoene, a compound that has anti-clotting benefits that contribute to better cardiac health. Anytime you are able to make delicious dishes with ingredients that are good for you, it’s a winning combination. 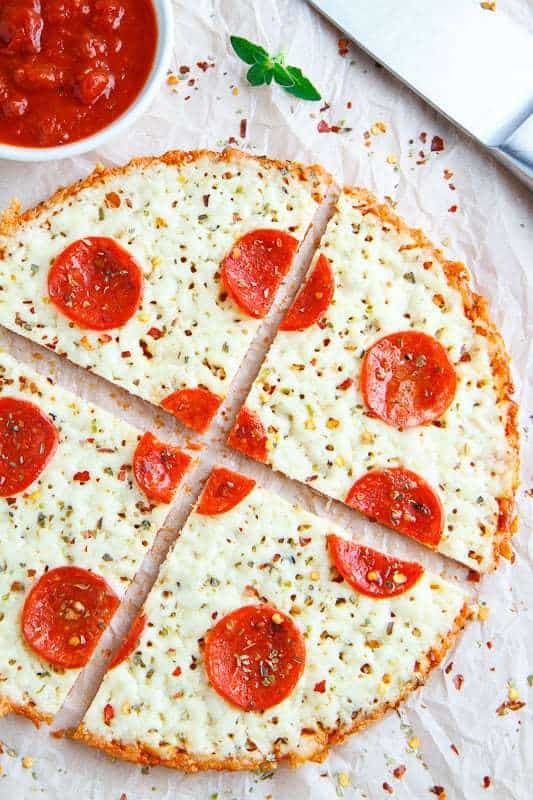 If you are following a Keto eating plan, this might be THE pizza crust you’ve been looking for. It is amazingly simply to make and it tastes divine. 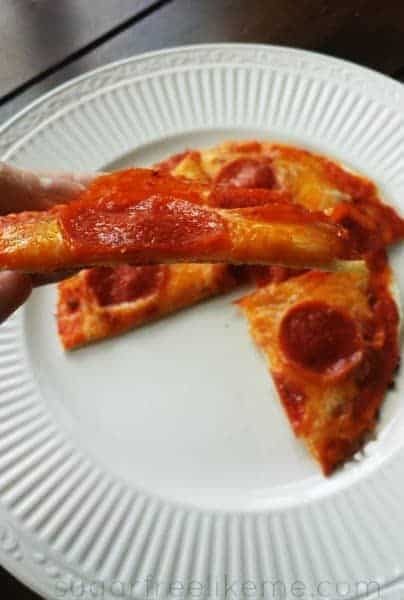 It is the closest low carb crust you will find that tastes like the high carb traditional pizza crust it will replace. If you love cheese, this recipe will quickly become one of your favorites. Almond meal replaces the flour, making this recipe gluten-free. 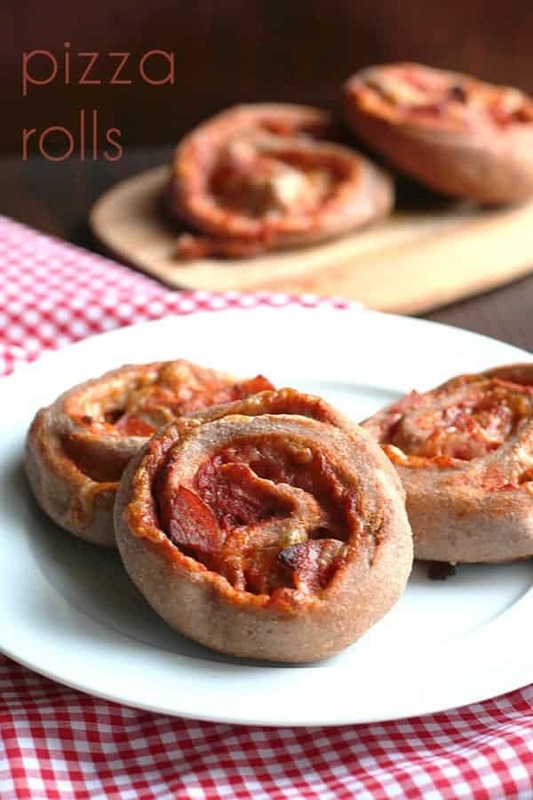 If you love those store bought pizza rolls but aren’t fan of the unhealthy ingredients, then try this recipe. Indulge your pizza cravings with a smaller, grain-free, low carb version that is healthier and just as satisfying. Coconut flour and almond flour reduce the grams of carbs found in traditional white flour. Egg whites add protein without upping cholesterol numbers and Psyllium husk powder gives these delicious pizza rolls just the right texture. This recipe takes a classic pizza and morphs it into a low carb version that taste so good, you’ll never miss those high carbohydrates. With a ground turkey base instead of bread dough, this dish is full of mouth-watering flavor. Top it off with your favorite marinara sauce, fresh Roma tomatoes and basil. Lycopene, found in tomatoes, is a powerful antioxidant. Tomatoes can also lower your triglycerides and your LDL cholesterol, leading to better heart health. A good way to lower the carbs in pizza is to use vegetables to replace the flour the crust is normally made with. Cauliflower and Zucchini are popular choices. Kale can now be added to the list. Kale is one of Nature’s “wonder foods.” Kale is an excellent source of vitamins A, C, and K. It contains heart-healthy Omega-3 fatty acids, and the flavonoids help protect your heart by reducing your blood pressure. It can help lower your LDL cholesterol, too. Using eggplants to make healthy pizzas is a great way to enjoy a guilt-free, gluten-free meal and reap extra health benefits at the same time. Eggplants contain compounds such as Chlorogenic Acid and Nasunin. These compounds have properties that help prevent cells from changing into cancer cells. Nasunin prevents cancer cells from developing new blood supply systems needed to multiply. The fiber in eggplants helps keep your digestive system healthy. 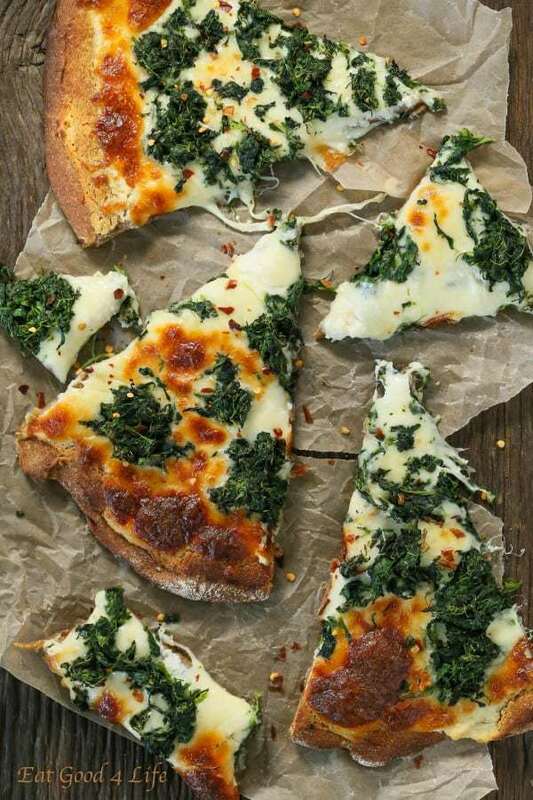 This recipe is a delicious way to enjoy pizza without a bread crust. It contains traditional pizza toppings like pepperoni and black olives which are tasty and good for you. Black olives are an excellent source of the heart healthy fatty acids that protect your arteries from cholesterol build up and blockages. Scientific studies show that the Vitamin E found in olives, may reduce your risks of developing certain types of cancer. Casseroles and pizza are the best kinds of comfort foods. Most casseroles and pizzas are high in carbs and fat, and not that good for you. This recipe aims to change that. 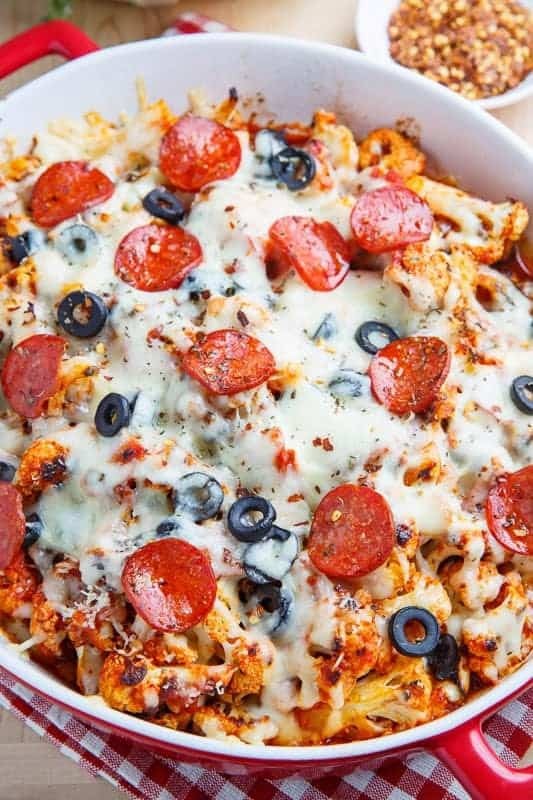 By substituting roasted cauliflower for the pasta normally found in casseroles, and the addition of your choice of pizza toppings, this healthier pizza casserole is almost guaranteed to become one of your family’s favorite dishes. This versatile recipe can be cooked on the grill or in your oven with the same delicious results. This pizza is gluten-free, low carb, and vegetarian, making is a good choice for anyone looking to eat healthier. The olive oil in this recipe contains heart-healthy fats that are good for you. 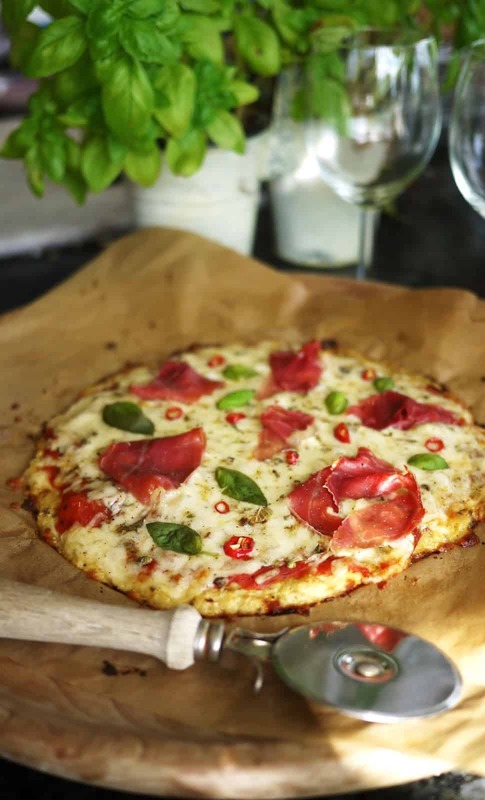 Finding low carb and no carb pizza recipes that are good for you and taste great can seem a bit challenging at times. The ones presented here offer delicious options and healthy benefits that will work for most eating plans. The key to better health and to better weight management is learning how to incorporate high quality ingredients into your daily diet that work for your health, not against it. Increase your fiber intake to fend off hunger. Low carb foods that are high in antioxidants, vitamins, and micro-nutrients are always a welcome addition. We only have one body and one life. We owe it to ourselves to take the best care of ourselves possible. Many illnesses and diseases can be prevented if we take the time and make the effort to eat healthier foods. Ongoing scientific research continues to show that improvements made to our daily diets have a direct impact on the reduction of non-inherited, preventable diseases like Type-2 Diabetes, Hypertension, and Coronary Artery Disease. Mindful eating has benefits that can be life changing, and in many cases, life-saving. If you aren’t quite ready to make big dietary changes, then start with small improvements. You will feel better and be on the road to enjoying better health.